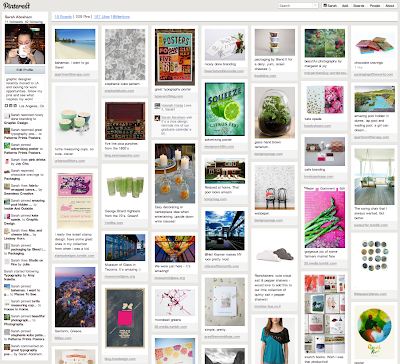 The latest social media favorite of mine is Pinterest, a virtual pinboard to collect images from around the web and following others to see trends, cool stuff and whatever inspires. Check out this image of some of my latest pins. It's wonderful site for ideas and inspiration. And unlike the real world, doesn't require blu-tack to stick magazine cuttings to the wall! In other news, I've just done some updating to my website, adding a couple of small things to my portfolio page plus some general housekeeping like fixing incorrect links and adding in new skills. Currently busy with some work and a Dreamweaver course (I can do websites! And HTML emails!) plus planning a couple of personal projects that I hope to get started sometime in the near future. But more photos soon!